Insane seizure effects with pong?! Yeah I made he great seizure game in 2days! :D With 3 different modes! A great amount of updates since last post! New and higher multihit bonuses. Killing a boss gives every rank upgrade. Sounds for upgrade pick and explosion. Haven’t had much time over the past couple of evenings. Didn’t get to do anything Monday night, but had a good few hours at it yesterday. Got a playable version online now. Still needs tweaking but I’m pretty happy with it at the mo. SFX are using bfxr and Music is courtesy of Kevin MacLeod/Incompetech. It’s all just textured primitives… Cubes, Spheres, Cylinders etc. And using a tree model from SA. Using mixture of Textures from Unity Standard assets, a free metal textures pack, the name escapes me right now, and a couple I threw together. So I’ve been thinking about playing around with the game mechanics a little more. I wanted to have some levels in there but that’s not gonna be happening. And I’ve been toying with changing the scoring system so it’s not just about goals, although I haven’t come up with anything that feels right yet. I’m hoping to get a chance to polish it up a little more, add some more audio, tweak the game play a little more etc. Also, I’m thinking about starting the game in 3rd Person view instead of Top Down, and maybe auto change views at set intervals, not sure about that though. I was originally going to call this as Whispers but then I thought of Ping and well… how can I not name it that for this MiniLD? The game is not a straight-up Pong game, just using the mechanics of Pong (mainly the ball hitting a paddle mechanic). As I mentioned in my previous post (though I’ve veered away from the relationship/friendship aspect of it), I’m making a social simulator. I freelance remotely. I spend a lot of time at home just because my work is computer-based (I’m here but not really here!). I’ve also had a lot of roommate experiences. Sometimes, I’ve overheard snippets of their conversations. My socially anxious self though often goes into overdrive and I start thinking those conversations were about me. I’m not the confrontational type so to this day I have never found out if those conversations were really about me. I’ve decided to implement this anxiety in game-form (what else can you do? hah). Inspired partly by The Novelist, you’re a writer trying to finish a book in 30 days. The line on the bottom of the screen is your “timer” – once you reach the end, the book is submitted to your publisher and depending on your progress/effort/quality of the book, you either will succeed massively, averagely or fail miserably. During the span of those 30 days though, you’ll randomly get these “pings” – a little circle that bubble up. It will float to the line above of the screen (you control the circle at the top of the screen). If you manage to “catch” it, the ping will bounce off your circle and go back below – which helps you write more and/or increase the quality of your writing. But, if you miss the ping, you’re going to get these distracting messages (seen below) from your roommate that may (or may not) be about you. These are harmful though because for X amount of time, your progress will be stalled while the timer is still going. Finished and submitted this game this morning around 8am or so, figured I’d make a post as well. After looking into participating in the next main LD with a group I’m working with, I figured I would use this Mini as a personal practice round. So this game is the result of 48 hours of development. Greetings! I have had friends entering Ludum Dare before but never entered myself. So now i have finally done it. Currently working on a losely Pong-based-arkanoid-schmup-blend. there isnt much content yet, but it is playable. Didn’t get as long on it today as I would have liked, but managed to tidy things up a little, got some simple AI, and some explosions in the form of mines The force the mines apply to the ball doesn’t always feel right, so I’ve got to sort that out. And I’ve been thinking about adjusting the score system so it’s a bit more pinball like. Maybe if your paddle was last to touch ball, you earn points when you hit mines, bouncer posts etc, and then goals work as a multiplier. I’m not sure though, but I’ll probably give it a try. As promised here is a preview video. Switches view from birds eye about half way in. With any luck I’ll have enough time over next couple of evenings to wrap it up. Might end up changing the name too, we’ll see. So this is is going to be my first LD submission. And technically second finished project I’ve ever made. Pretty excited. Hopefully I can get it done within the next day or so. I’m still pretty damn new to it all, but i’m a stickler for polish, so it might take me longer than most. Pong + Arkanoid + you control the ball. Long time LD follower here, finally decided to get involved. Figured this would be good practice for 32! Started yesterday, in Unity, making good progress. Main mechanics of the game are in and some nice visuals. Need to work on some more obstacles/things to drop in to the game arena, bombs/explosions etc. It’s basically a Pong/air hockey/pinball hybrid at the moment. I went to LD today just to find out when the next LD was going to be held and much to my surprise I found out about this Mini LD. This is my first game jam (and third game I’m making in my still early game-making journey) so I’m quite stoked for this! 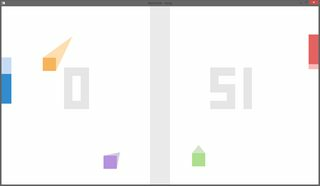 I think I’m going to deviate a little bit from the original Pong and instead use it as a springboard for something else. As odd as it sounds, I’m thinking of making a relationship/friendship simulator (partly inspired by one of Mike Mezhenin’s game, “Where Are Your Friends Tonight“) but with Pong-like mechanics. Although as I’m tilting towards more of an abstract aesthetic (can’t draw quite as well as I design hah), when you play the game, you probably won’t even realize it’s a relationship/friendship sim! I’m planning to make it with Construct 2. Hoping to get the idea fleshed out this weekend (have some ideas on how it could be Pong-like but still in progress). Then this week, will work on trying to figure out how to integrate the mechanics into Construct 2. By next weekend, hoping I’m all done and polishing! 17 queries executed in 0.113 seconds.